Taking fish oil supplements to prevent cardiovascular disease and cancer may not be effective, a new study suggests. We're going to switch gears now. We want to talk about two popular nutritional supplements - vitamin D and fish oil. A lot of people add them to their diets. Research has suggested that both of these nutrients might help reduce the risk of heart disease and cancer. Today, the results of a large, new study on the subject were released at the American Heart Association Scientific Sessions in Chicago. NPR's Patti Neighmond has the results. PATTI NEIGHMOND, BYLINE: There were two major studies. One looked at whether vitamin D cut the risk of cancer or heart disease. The other looked at fish oil. In both cases, the answer was no. NIH scientist Dr. Lawrence Fine. LAWRENCE FINE: Both trials were negative in that neither trial showed overall that heart disease was lower in those who were taking either fish oil or vitamin D.
NEIGHMOND: And the same goes for cancer. 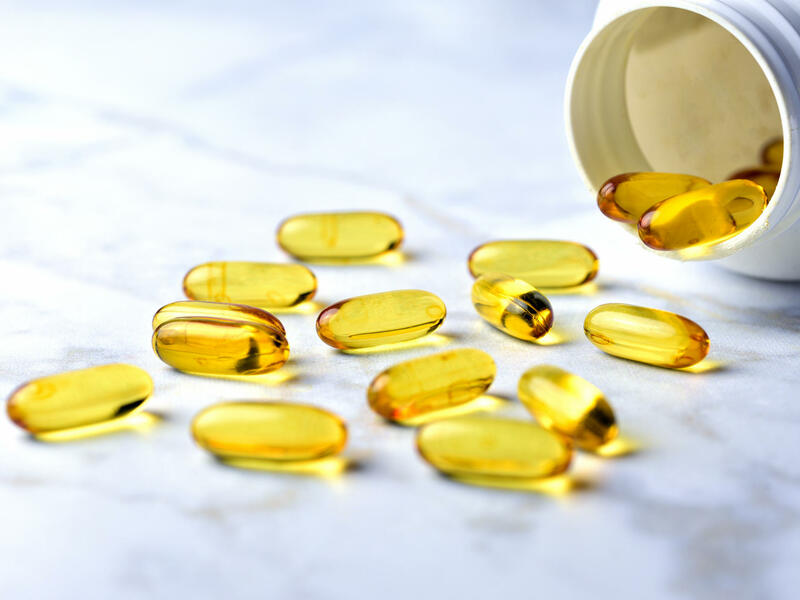 There was no benefit of fish oil or vitamin D. NIH funded this study of nearly 26,000 healthy adults age 50 and over with no history of cancer or heart disease. Some received fish oil. Some received vitamin D. Others took a placebo. After more than five years, researchers from Brigham and Women's Hospital in Boston were unable to find any overall benefit. But lead researcher Dr. JoAnn Manson says there did seem to be a benefit for one aspect of heart disease. JOANN MANSON: The omega-3 fish oil did lower the risk of heart attack by about 28 percent. NEIGHMOND: And those who appeared to benefit the most were people who didn't eat much fish as well as African-Americans. MANSON: African-Americans had a particularly large reduction in the risk of heart attack - about a 77 percent lower risk. NEIGHMOND: Researchers didn't investigate why this may be, and Manson says the findings need to be confirmed in future studies. In the meantime, NIH official Fine says don't throw out your fish oil and vitamin D.
FINE: At this point, if one is thinking about supplementation - either omega-3 or vitamin D - I think talking to your physician or to your health care provider soon is the next step. NEIGHMOND: Another study looked at whether a highly concentrated form of fish oil might reduce adverse events among people who already have cardiovascular risk factors like hardening of the arteries, diabetes or high blood fats. Cardiologist Dr. Deepak Bhatt with Brigham and Women's Hospital headed the study. DEEPAK BHATT: The trial overall found a 25 percent relative risk reduction in important cardiovascular events such as dying from cardiovascular causes, having a heart attack, having a stroke, being hospitalized for chest pain or needing procedures such as angioplasty or stenting or bypass surgery. NEIGHMOND: It's important to note this study was paid for by the company that makes the drug. Bottom line as always - whole foods are the best option for both vitamin D and fish oil. That includes fatty fish like sardines, tuna and salmon and, for vitamin D, also fortified cereals, milk and orange juice.